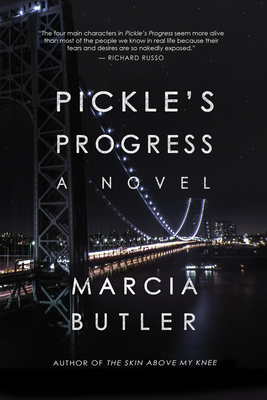 Join us at Book Culture on Columbus as Marcia Butler celebrates the release of her new novel, Pickle's Progress,on Tuesday, April 9th at 7pm! Author Jillian Medoff will be joining Marcia in the celebration and discussion. Marcia Butler’s debut novel, Pickle’s Progress, is a fierce, mordant New York story about the twisted path to love. Over the course of five weeks, identical twin brothers, one wife, a dog, and a bereaved young woman collide with each other to comical and sometimes horrifying effect. Everything is questioned and tested as they jockey for position and try to maintain the status quo. Love is the poison, the antidote, the devil and, ultimately, the hero. Marcia Butler has had a number of creative careers: professional musician, interior designer, documentary filmmaker, and author. As an oboist, the New York Times has hailed her as a “first rate artist.” During her musical career, she performed as a principal oboist and soloist on the most renowned of New York and international stages, with many high-profile musicians and orchestras – including pianist Andre Watts, and composer/pianist Keith Jarrett. Her interior designs projects have been published in numerous shelter magazines and range up and down the East coast, from NYC to Boston, to Miami. The Creative Imperative, her documentary film exploring the essence of creativity, will release in Spring 2019. Jillian Medoff is the acclaimed author of four novels. Her latest, THIS COULD HURT, an “absorbing workplace drama with heart,”* and Indiebound bestseller, landed on many Best of/Must Read lists, including Amazon, Entertainment Weekly, NY Post, Real Simple, O Magazine, People, Fast Company, Parade, and the Millions, among others. She also wrote the much-lauded national bestseller I COULDN’T LOVE YOU MORE, GOOD GIRLS GONE BAD, and HUNGER POINT, which was made into an original cable movie starring Christina Hendricks and Barbara Hershey. A former fellow at MacDowell, Blue Mountain Center, VCCA and Fundacion Valparaiso in Spain, Jillian has an MFA from NYU.